One key tip in bathroom design is that it should cater to their needs - be it to relax, recharge or indulge. This is because it is the one place where they can relax completely and shut the rest of the world out. It is also a place where they can truly be themselves (nasty habits and all!). In the case of a client who enjoys having guests, the bathroom interior design includes a day bed for lounging in after a bath or for a chat if a friend drops by. Natural materials which add warmth are used here: the walls are teak-clad while the bath and basin are in volcanic rock. For indulgence, the bath sits centrally in the room and overlooks the rear terrace. Recessed lit floor panels on the floor surround the bath, giving the illusion of elevation. To either side of the day bed, enormous boxed closets are disguised as regular doors: handles pull the closets forward into the room. In another bathroom interior, the brief was to create a relaxing environment which is easy to maintain. Thus plain dark gray mosaic bordered in polished black tiles are used on the floor and the walls. A mirrored wall and unique washbasin in black marble top and polished steel adds an edgy touch. The result: a modern bathroom with a neoclassical feel. 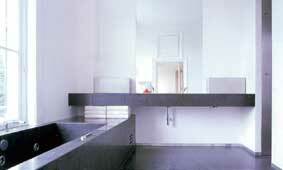 Most apartment bathrooms are restricted by size, ceiling height and availability of natural light and ventilation. When you're renovating your bathroom, remember these minimal clearances - 32 inches (80 centimeters) for walking, 24 inches (60 centimeters) for knee space in front of the toilet bowl and 10 square feet in front of the wash basin. I’m working on more bathroom interior tips and ideas so I would appreciate your feedback on topics you’d like me to cover. Click here to return to the top of bathroom design.